FINALLY Get Organized! With DearMyrtle continues. 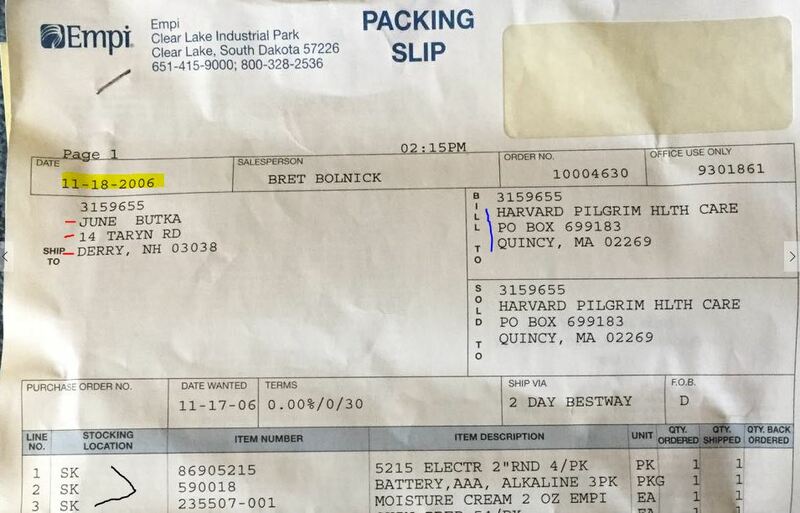 Why is this packing slip important in regards to genealogy? It answers several question we ask ourselves to provide important evidence in regards to June Stearns Butka. It also tells you that this health care provider paid for medical supplies ordered. It does not tell medical history or what the supplies were used for, You know it was an electrical device requiring, electrodes, batteries, moisture cream, cut off at skin prep. It was shipped in two days. Why would June require medical supplies? What was her diagnosis? Does a family member know the answers to the questions? Here is the rest of the story from the horses mouth. June Stearns Butka diagnosis was chronic pain due to degenerative disc disease, bulging discs, connective tissue disease and Fibromyalgia. Physical Therapy was ordered. The use of a device called T.E.N.S. unit (Transcutaneous Electrical Nerve Stimulation) to reduce the pain was successful. She was discharge from Physical with exercises and an order to use the unit at home for pain. Here is my attempt to properly cite this artifact for June Lee Stearns genealogy file, using Elizabeth Shown Mills, Evidence Explained 3rd edition page 112, Private Holdings: Personal Correspondence. 1. Empi, Clear lake Industrial Park, Clear Lake, South Dakota 57226, to June Butka, 14 Taryn Road, Derry, New Hampshire, Letter/Sale receipt, 18 Nov 2006, providing list of medical supplies for June Butka, Personal Correspondence, 2006; Stearns-Butka Family, June’s Lee Stearns Research File; privately held by June, privately held by June Stearns Butka, Address for Private use, Merrimack, New Hampshire. 3. Richley-Erickson, Pat “Finally Get Organized,” Dear Myrtle, DearMyrtle’s Genealogy Your Friend In Genealogy since 1995 Blog, 31 Jan 2016. http://blog.dearmyrtle.com/p/finally-get-organized.html: Access 2 Feb 2016, checklists.